You may have seen the shy tarsier named Nee in my last post, for the topic “Shiny” at Illustration Friday. 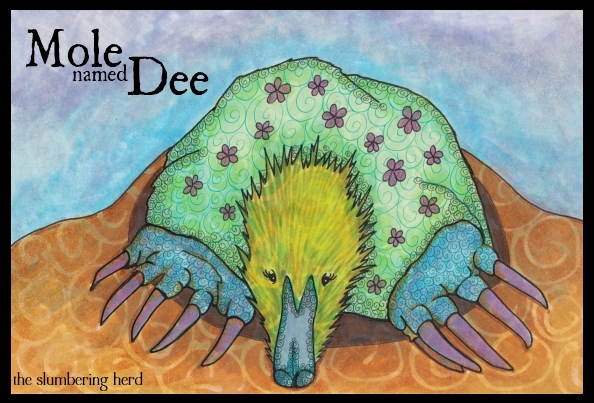 And now, a mole named Dee for the topic “Moldy” at Monday Artday. Perhaps you sense a trend? Time will tell! She was halfway out of her den before stopping for a breath, and also to rethink her evening plans. Yes, it would be nice to visit her sister Dinky for grubs and gossip about that new family of field mice. But Dinky had insisted on moving so far away, and only eighty percent of the route was reachable by tunnel. After a moment’s more thought she turned and went back inside. A nap sounded mighty fine. I think I went too dark overall, from fussing with it too long. Wasn’t happy with the colors though they ended up not too bad. She’s also a tad lumpier than needed. Aaah! Reference photo from the University of Zurich; font is Ugly Qua. This entry was posted in Copic Markers, Progression Photos, sketches, Unusual Animals and tagged beasts, Copic Markers, illustration, liquid frisket, mole, monday artday, pen & ink on June 14, 2012 by The Beast Tender. Wow, Dee is wonderful! I think the colors turned out really well..not too dark at all. Goodness, great perspective on this piece. Fabulous claws and pattern on little Dee! Great lateral thinking and she is a real cutey! I love how she’s totally transformed in the last frame to be as beautiful as a mole can be! She’s a fav. the color, particularly the sky and head, along with the larger scale pattern at her little claws which lends movement to them. Lovely! great colors and textures! well done! She is great – not too dark at all! Her plumpness suits her thinking process very well:-) Very cute! I love this image. And such a creative way to use an inspiration prompt word! Add another vote for not too dark. I love the head-on view. Who’d’a thought a mole could be so cute? Very lateral thinking. Love it! I know that I will always have a chuckle when I see your IF prompts.